If you have a custom project in mind, let Murdock help! Request a quote to get started on your project today. 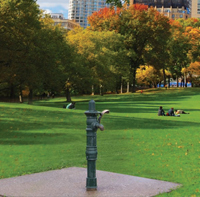 All of our Contemporary fountains are designed with heavy 11 gage galvanized steel and come powder coated in our standard Fairway Green color. To maintain year-round beauty, the galvanized metal is immersion coated in a zinc rich primer before the final color is applied to help ensure minimum maintenance. This process coats the outside and inside of the fountain for the ultimate in corrosion protection. The contoured stainless steel basins with rounded corners and edges reduce splash over, insure proper drainage and reduce standing wastewater. 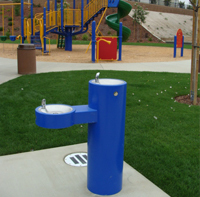 Vandal-resistant bubblers are one-piece cast brass and chrome plated. All Contemporary fountains are push-button activated with the Seasonal models having “through-the-button” adjustable flow control. In addition, logically placed matching access panels allow for an easy “hook-up” of all the plumbing connections. Murdock now gives you a better reason to bring your pet along. 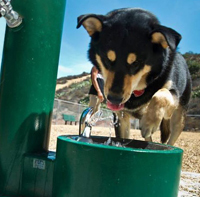 Offered in a variety of styles, Murdock pet fountains are the smart choice where a thirsty pet can drink. Available in seasonal or year-round use models, they are made to withstand the test of time – even in dog-years. And, our hydrants and exclusive Horse Font will satisfy any horse enthusiast! Murdock post and yard hydrant are the foundation of the brand. 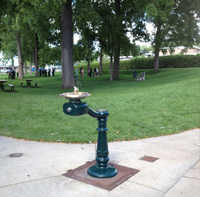 Since 1853, Murdock has manufactured the “Genuine” brand of hydrants. 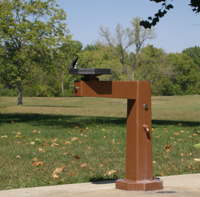 In 1869, Murdock introduced the “Genuine” Street Washers known today as flush box hydrants or “street washers.” To this day, Murdock hydrants are still made to the same exacting standards in quality of materials and workmanship. 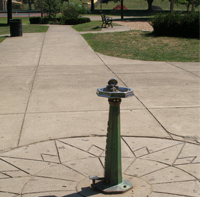 The Murdock line of hydrants is built for long-life and freedom of repairs to their inner works. This series is used in small parks without team sports facilities, golf courses, and other areas with lower usage. 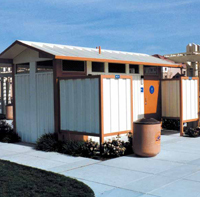 With different signage, the Fairway Series functions well as unisex restrooms. During times of less usage, some of the unisex restrooms may remain locked. The external modesty screens are optional on Fairway buildings. 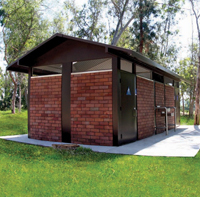 Restroom additions and concession, storage and shelter additions may be added to a Fairway building. A stainless steel toilet riser with one toilet riser per vault. A 12 inch diameter black vent pipe for each vault on the south side of the building. Black polyethylene vaults with external cleanouts. Ventilation openings on all exterior walls. The Pathway Series buildings have the most versatile layouts. 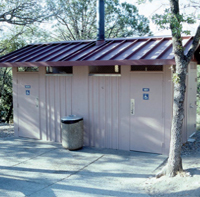 These multi-person restrooms are used in medium to large parks. They can range in size from Series 3 (3 fixtures per restroom) to Series 12 (12 fixtures per restroom) but Series 3 thru Series 6 are the most common. The Pathway Series has a chase storage area 5 feet wide which can be enlarged to 9 feet, 13 feet or 17 feet for increased storage. Storage buildings are made in a number of sizes ranging from 10 feet by 10 feet up to 25 feet by 60 feet. These buildings are constructed with our usual heavy-gage walls and are suitable for any area needing vandal-resistant storage. 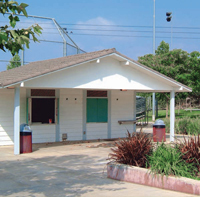 Concession buildings are similar but include “windows” with heavy-gage doors and stainless steel serving shelves. Interior equipment is provided by the owner. 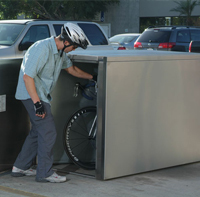 Murdock-SuperSecur Bike Stor lockers whether made of steel or stainless steel, represent unsurpassed security, permanence, and an attractive addition to your setting. These lockers, commonly made of 14 gauge steel storing two bikes each, are suitable for home, campus, industrial, parks, law enforcement, transit malls or anywhere a safe, secure enclosure is required. Sturdy and heavy-duty, they are built for a lifetime of use in the harshest environment.